Decorations don't have to make or break your baby shower. Using free, printable baby shower decorations will save you money and time, and you still can have the shower looking fabulous. These free decorations can be hung on walls or set on tables. There are all kinds of free banners, signs, favor boxes, water bottle labels, and tags that will help you have the party looking great. Some are even in complete sets so everything can match. These decorations go perfectly with other baby shower printables like invitations and games. A must-have baby shower decoration is a banner. They're easy to decorate and a great way to share the message of the shower. You can hang these on the wall or on the edge of the gift or cake table. This baby elephant banner is adorable for a girl or boy shower. This banner spells out "Cute As a Button" in your choice of blue or pink. "Welcome Baby Girl" This printable banner is great for a guest of honor having a baby girl. 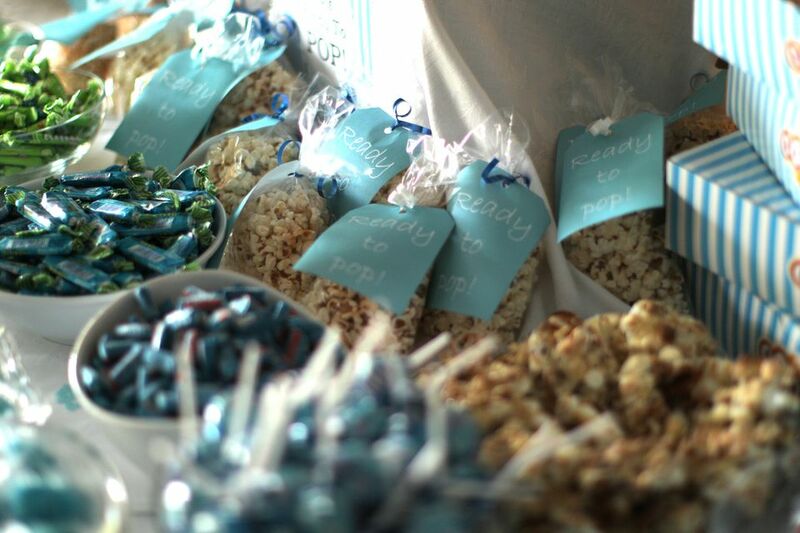 This fun gray and blue banner fits perfectly with an "Oh, Boy" baby shower. Here's a vintage banner that includes blank cards so you can include the name. These alphabet cards make a great baby shower banner, and the mom-to-be can use them as alphabet flashcards later on. Here's another free baby shower banner perfect for celebrating a baby boy. These free, printable favor boxes double as baby shower decorations and give the guests something to take home. They can be filled with candy or other inexpensive trinkets. These cute favor boxes look just like the old-fashioned alphabet blocks. Print out this template and use it to make a baby carriage favor box. Print out this template that makes a box with a lid that says "Thank You." A free printable to make a paper basket for your baby shower. There's also an adorable tutorial here on how to make Nutter Butter Babies. Here's a free printable for a favor box and favor bags that hold bags of tea. These printable baby shower decorations are cute little bug boxes that will hold any type of favor. These free baby shower decorations you can hang on the wall or sit on the tables. They also make a great gift for mom at the end of the shower. "Keep Calm and Baby On" An adorable printable sign for the baby shower. Customize this jungle-themed welcome sign before printing. "Cue the Confetti" Two different baby shower sign designs perfect for a baby shower celebrating a little girl. More "Keep Calm" signs: Four different versions of baby showers signs reading "Keep Calm and Baby On," "Keep Calm It's a Baby Boy," "Keep Calm It's a Baby Girl," and "Keep Quiet the Baby's Sleeping." "A Baby's About to Hatch" frameable print: A very cute baby shower sign that can double as a gift for mom. These baby shower tags and labels can be used to attach to favors or as cupcake toppers. They're a great addition to the rest of your decorations. "Think Pink" and "Baby Blue" tags are perfect for attaching to pink or blue nail polish, which can be given to guests as a favor. Printable baby shower mini-tags can be added to just about anything to make a very cute baby shower decoration. Rain showers favor tag goes with a traditional baby shower theme. These water bottle labels make for great decorations you can set at every place on the table or on the food/cake table. Water bottle label designs include guppies, football fields, anchors, dots, and flowers. Here are some baby boy water bottle labels with plenty of other matching printables. These water bottle labels for a girl feature pink poodles. A great way to get free baby shower decorations is to borrow decorations from someone else who has recently had a baby shower. Since the decorations don't have much use after the shower is over, they'll probably be relieved to get rid of them. If you can't find enough free baby shower decorations you like, consider saving money by buying some inexpensive decorations. Balloons and streamers are some great options that will save you money but still be colorful and fun at the shower.